The term ‘addition by subtraction’ refers to the potential for improving something by removing one or more variable from the equation. In a sports context it’s normally applied to a scenario where the elimination of a negative factor (an under-performing player or negative influence on a team, for instance) results in some type of improvement. But in golf, less is more, right? We want those scores to go down, not up. Therefore, the title of this post is Subtraction by Subtraction. Same concept, but embracing the points below will result in strokes being subtracted from your average score. Got it? Okay, here we go! When a missed putt is followed in rapid succession with another, almost always harder putt out of anger or disgust, nothing good can come of it. The thought right before that action is taken is usually something along the lines of “I can’t believe I just missed that #*$^@* putt!” The specific reason that anger translates to firing another disc at the basket has never been scientifically proven, but I suspect it has to do with the general desire to throw something at something when frustrated. The problem is that this rash act is detrimental to one’s game in a couple different ways. First of all there is the issue of emotional control. Getting overly excited (due to negative events or positive events) is likely to take a player’s focus off of where it needs to be. Decisions then get made based on emotions rather than logic, which is not a good thing. That tendency is always lurking in the shadows if not already romping around freely, and an emotional outburst is like a size 14 wide foot-in-the-door. It may be easier to stay calm in Hawai’i, but angry second putts are never a good thing. Photo by Al Schwartz. The other issue at play here is the fact that players who make this mistake are in essence reinforcing bad technique- unless firing the putter with extreme malice is how he always putts. Regardless of whether the rash second putt goes in the basket or not, it serves no constructive purpose since it isn’t representative of the players ideal form and tempo. If you’re playing a casual round or a match play event where practice putts are not prohibited, and you take an extra putt or two not as an angry reflex but because you immediately recognized a flaw in your putt and want to iron it out, that’s completely different. In that case the behavior is constructive and completely fine. As a general rule, the proper thing to be thinking about during a round of disc golf is the next shot. Any other thoughts are unproductive at best, and capable of downright sabotage at worst. But we are not machines, and our minds will go where they will go. The trick is to recognize when it has wandered into the wrong zone and guide it back to the right one: the next shot. And briefly reflecting on the shot just thrown is a good practice, as long as that reflection is brief and of an analytical nature rather than simple second guessing. Personally, I like to capture the details of the shot and the results like a snapshot in my mind, move on to the next shot, then analyze the notable ones (good and bad) later after the round. Whether you do it briefly during the round, afterward, or both, the key is to approach your review and appraisal in a constructive frame of mind. Collect information rather than passing judgement. Why did the disc fly that way? What should I do differently next time? Second guessing is just dwelling on the past. If your reflections on an errant throw stop there they serve no constructive purpose, and worse, erode confidence in both your skills and your decision-making. 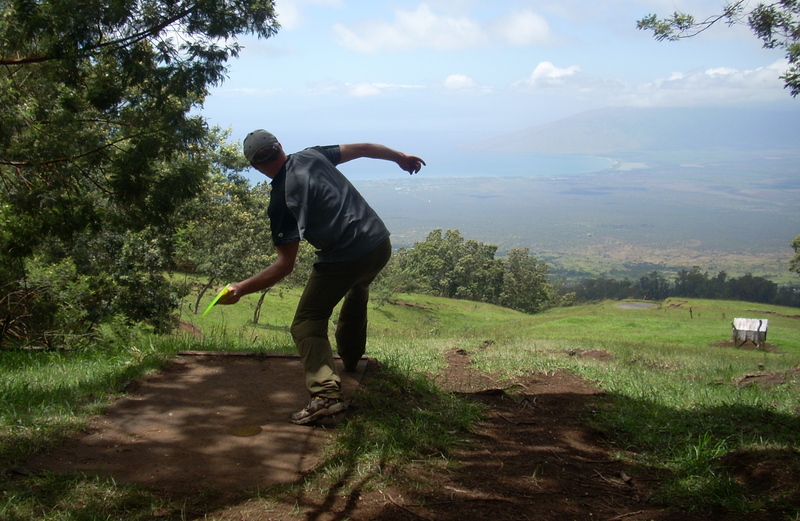 Instead, use every throw as an opportunity to add to an ever-growing database that helps you benefit from each disc golf experience. A major element of playing smart golf is to know your own game. Don’t confuse confidence with wishful thinking. You may really, really want to clear that lake with your drive, but if your longest throw ever was 350 feet in perfect conditions and a 345-foot drive is required to reach the opposite shore it probably isn’t the wisest choice. Smart golf is about, to loosely paraphrase Clint Eastwood, knowing your limitations. A big part of game management in golf is being able to quickly assess the percentages for any given shot. What is your chance of successful execution? What is the reward if you do- and the repercussions if you don’t? If you’re not able to make a realistic and sober assessment of your own capabilities, assessing accurate odds on a shot is nearly impossible. A similar and fairly common error that is even more insidious in the way it can creep into one’s thoughts is letting the shot of another player influence decision-making. This can happen on drives, putts and anything in between. Sometimes it’s seeing someone else get big distance then overthrowing to equal it. Other times it’s seeing a different approach or route and reconsidering what you had planned. And yet others it’s pure, uncomplicated ego. You were planning to lay up a tricky 35-foot putt, but the other guy goes for his that happens to be five feet longer and just as risky- and nails it. Make a decision and stick with it- despite what the other guy does. Photo by Jack Trageser. In some of these situations the alternative actually makes sense, but all too often last minute changes-of-mind based on another player’s shot result in disaster- regardless of whether they make sense or not. Trust your own instincts and play your own game. It’s you against the course (and the occasional unruliness of your own mind). Sometimes actually sticking to this advice may require drastic measures. There have been times where I’ve been grouped with players that all had more power off the tee than me, and I purposefully didn’t watch their drives so as not to be influenced! Everyone is guilty of this one at one time or another, and correcting it is not so much a matter of eliminating a bad habit as increasing awareness of when it’s most likely to happen. Some ‘mis-throws’ stick with me longer than others, and I’m guessing I’m not alone. And when I am faced with a similar circumstance with that mistake fresh in my mind, the overriding thought in my mind is ‘don’t make the same mistake this time’. For example, I might have tried to throw a neutral-stable disc with an intended flight path of flying straight for the first half of the flight and then turning over the rest of the way without coming out and hyzering back at the end. 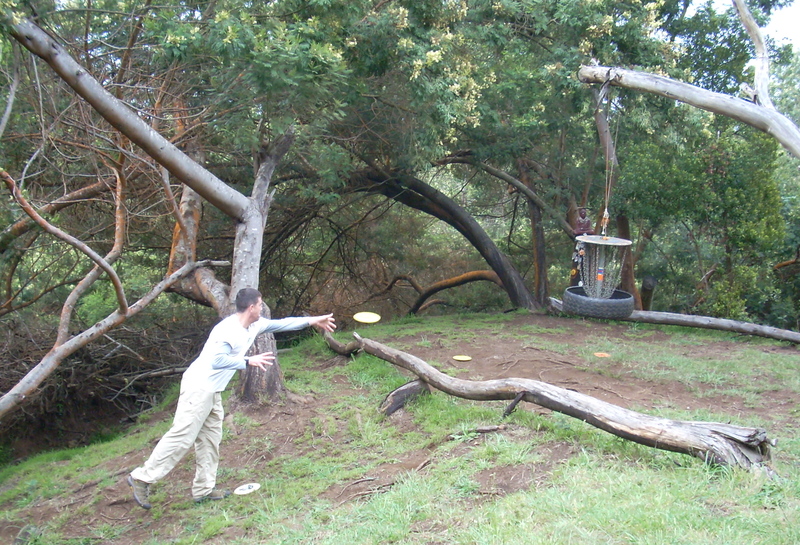 Instead, the disc turns over too soon and flies right into the trees I intended to get past then curve around. The next time I’m faced with that same shot or a similar one, I remember the earlier mistake and am focused almost exclusively on not repeating it. There are two different reactionary flaws that can result from this: the ‘ol over correct and the ol’ double correct. The over correct is a scenario that is usually immediately apparent to the player when it happens- like chucking the disc 50 feet past the basket on a short hole because it came up 25 feet short the last time. The ‘ol double correct, on the other hand, is a little more complex. Consider the example above- the one where the disc turned over too soon. With this shot, there are a number of different ways I might try to affect a different outcome. I could start the disc on a more conservative line, or give it more elevation, or less spin . . . or even throw a different disc. Any one of these might work, with the key word being ‘one’. Sometimes rather than thinking sharply and clearly about the problem and arriving at a specific solution, I let all of those possibilities float around in my head and end up employing two or more of them. For instance, I might throw the disc a little higher and take a little off of it, resulting in a shot that never turns over at all. The central theme in this type of mental error, and the habit to avoid, is focusing on the mistake rather than the necessary elements of the same shot executed correctly. Turn ‘don’t do this’ brain commands into ‘do this’ commands. And that brings us to one final point, the broader problem of negative brain commands. These come in many different flavors (including the ones just mentioned), but my favorite example is thinking to yourself ‘don’t hit that tree’. The better objective, of course, is ‘throw the disc right in the middle of that space between that tree and the bushes to the left of it. If your thought is ‘don’t hit that tree,’ the brain, for some reason can’t process it successfully. Either it just hears the last three words (‘hit that tree’), or it can’t discern the logic of not doing something. It knows that the only way to be certain to not hit the tree is to not throw the disc. Yet the disc must be thrown, so it turns more into a hope than a confident plan. Out of all the mental errors listed here, this one might be the simplest to catch and correct. Whenever you notice yourself speaking or thinking about shot selections and objectives phrased in the negative (hint: the word ‘don’t’ is almost always involved), take the time to replace it with the positive alternative. All of the things listed here are logical and difficult to argue with, I think, but agreeing with the logic doesn’t make it easy to eliminate the mistakes. The best advice is to learn to be more conscious of all the thoughts floating through your head and find ways to replace them, or better yet prevent them from showing up in the first place. The example I gave of not watching my competitors’ drives so I wouldn’t automatically overthrow trying to match them is only one of the little devices I’ve created. For me, overcoming these mental flaws is half the fun of the game. Previous postAll things disc golf. Dot com. A mantra of mine (but not always an effective habit, I’m afraid) is “Never Putt in Anger”. After a year-and-change worth of playing DG, I have improved my driving, straightened out my putting, and discovered how much mental re-adjustment I need to work towards in order to translate these skills into lower scores.